Making these salted caramel cookie bites was much easier than I thought. These are made to be small little bites of deliciousness but if I were to make them again, I'd definitely make them into bar cookies. The cookie itself has a rich, depth of flavor due to the amount of brown sugar used. Once baked, the cookies are drizzled with buttery caramel and sprinkled with chopped toasted almonds and a tiny pinch of coarse sea salt. With every bite, you get to enjoy the sweetness of the cookie, saltiness from the sea salt, creaminess of the caramel and the crunchiness of the toasted almonds. These bites are addictive... you have been warned! Preheat the oven to 375°F. Grease (or line with paper cups) a mini muffin pan or a filled teacakes pan. In a large bowl, beat together the sugar, butter, salt, vanilla, and flavoring until well blended. Add the baking powder and egg and beat until fluffy. Mix in the flour. Use a rounded teaspoon scoop to fill the 20-24 cups of the mini muffin pan. Bake the cookies for 8-10 minutes, until browned around the edges. Cool in the pan for 15 minutes. 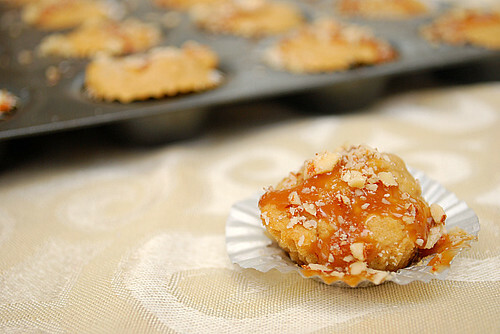 Just before serving, drizzle the caramel sauce over the top of each cookie a sprinkle with almond and salt. Ooooh, salty/sweet desert bites, yum! This reminds me of the Vosges chocolate bar w/ bacon. 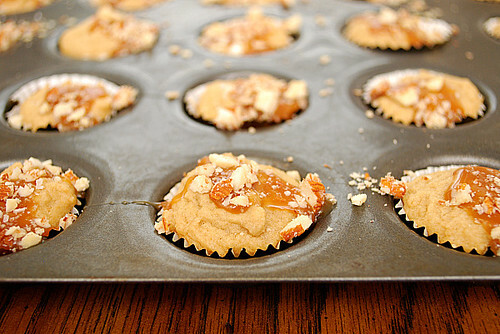 Oh man - salted caramel is one of my new obsessions and these look fabulous! Can't wait to try them out!! Even though I don't like mixing sweet and salty this looks deliciuos. I will definitely try this recipe (the caramel and almonds are my favorite) and I'm sure my hubby will love this because, unlike me, he likes mixed flavours. Yummm, I am so making these! Can you tell us which caramel sauce you used? Thanks. I like it when it is bite size! That would be better I guess! 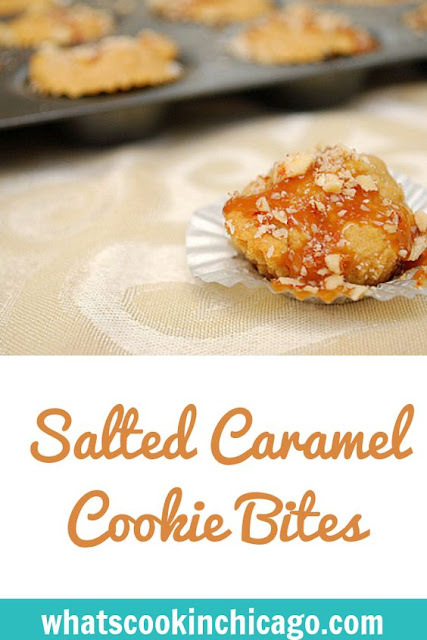 Salty caramel is what my kids love so this is perfect for them. The kids will definitely love this treat! They love caramel so much! Thanks for sharing this! Your cookies are delicious. You just made me starve. I totally love it!